Find all the infos you need for your stay in my notebook below. Make a quick stop at the hotel driving zone to do your check-in. 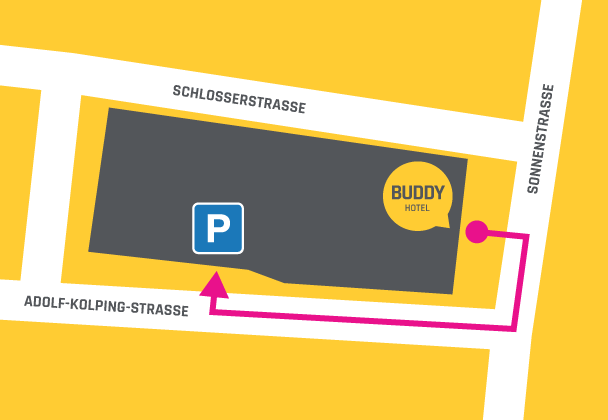 Afterwards park your car in the Buddy-Garage on Adolf-Kolping-Straße for only € 15,00 per night. Enjoy your first coffee while still in bed. Your Buddy invites you to free snacks like pretzels, croissants and fresh fruit at Buddy’s Corner on the 2nd floor. Hot coffee beverages from our 24/7-Deli-Bar will fuel you for the day. Explore the city with Buddy’s City Insiders on your tablet. Your buddy tells you all about the must-see-places of Munich. Not simply a lobby, we call it Buddy’s Corner. It’s located on the 2nd floor. Discover another express-check-in-terminal and a 24/7-Deli-Bar. There you’ll get cool drinks, yummy snacks, hot coffee beverages and anything else you might have forgotten at home. Get a cozy sleeping place for your car in our garage for only € 15,00 per night. Book your parking space via the express-check-in-terminal. Store your luggage at Buddy’s Luggage Drop-off in the basement and enjoy your last hours in Munich. Find your express-check-in-terminal at the main entrance or at Buddy’s Corner on the 2nd floor. Just enter your name and reservation number and confirm by digital signature. Your room key will drop out within seconds. Late risers just love Buddy’s hospitality. Relax until 12:00 pm in your room. Your check-out runs automatically and your room key expires. Enjoy your free morning coffee while still in bed. You’ll get replenishment at our 24/7-Deli-Bar in Buddy’s Corner on the 2nd floor. Your Buddy provides a hairdryer in your room for all kinds of haircuts. Your Buddy will be there for you 24/7 for any requests and needs. Use the tablet in your room or at Buddy’s Corner on the 2nd floor to get in touch with your Buddy-team. To enter your Buddy Hotel use the door code from your welcome e-mail. Never mind about the party mess with your Buddy; from 08.00 am -16.00 pm all will be tidied up again. After your stay your Buddy will send you the invoice via e-mail. With the room key in your hands you are set. Just hold the key up to your door lock and you ‘re in. Please keep in mind that your room key only works until 12:00 pm on the day of your check-out. Only guests with valid key cards have access to your Buddy Hotel. In case of an emergency your Buddy-team is available 24/7 via tablet. Discover our 24/7-Deli-Bar at Buddy’s corner on the 2nd floor. You’ll get cool drinks, yummy snacks and hot coffee beverages. Video- chat with your Buddy-team via tablet at buddy’s corner on the 2nd floor. Discover our 24/7-Deli-Bar at Buddy’s corner on the 2nd floor. Cool drinks, yummy snacks, hot coffee beverages and anything else, you might have left at home are ready for you anytime.